Two academics from Bangor University’s renowned Business School have been applying their knowledge of marketing and managerial studies to investigate a new medium for getting the no-smoking message across- the cigarette itself. It turns out that we may not be as good at bargain hunting and taking advantage of supermarket ‘offers’ as we think. That’s according to early results from a study which brain-scanned people undertaking a ‘virtual’ supermarket shopping trip to buy party-food. Primary School pupils following a healthy eating project run by a Bangor University ‘spin-out’ social enterprise, met with UK Chancellor George Osbourne MP recently. The children at St Vincent’s RC Primary school in Knutsford, Cheshire are following a new pilot programme of the Food Dudes project which is designed to improve healthy eating amongst children. Student Christmas Market goes down a storm! 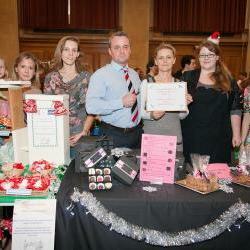 The B-Enterprising team at Bangor University hosted the fourth successive Student Christmas Market in PJ Hall before Christmas. Bangor University is to welcome future global leaders to study at the University under the prestigious Chevening Scholarship programme. The University is one of a handful of UK universities to host Chevening Scholars and joins Cambridge and Durham universities in offering Chevening’s Central Partnership Scholarship programme. An 18-month partnership between resident ensemble at Venue Cymru and Bangor University, Ensemble Cymru and television company, Cwmni Fflic (Fflic Company) is on course to significantly raise the profile of classical music for family audiences across Wales. Bangor University students are being urged to ‘Choose Well’ for health treatment this winter following the arrival of a national campaign at campus. Bangor University recently presented a cheque for over £12,000 to local charity Ty Gobaith after another successful year of fundraising. A World Champion double Gold medal winner was among the students receiving Awards at Bangor University recently. A flagship Welsh development programme described as “game changing” and which harnesses the talent of top researchers in Wales to help tackle some of society’s major challenges has secured a national accolade. If you’re looking for unique Christmas gifts for your friends and family, look no further than Bangor University’s Student Christmas Market, which will be held on Friday, 6th December at the University’s Prichard-Jones Hall, between 12 – 5 pm. Scientists studying snake venom have for the first time sequenced the entire genome of a venomous snake, the King Cobra, and confirmed a previously proposed but poorly documented hypothesis explaining how snake venom is produced and what led to the great complexity of venoms consisting of dozens of individual toxins. Assembly Members and health and care professionals were invited to a reception at the Senedd in Cardiff today (3.12.13) to hear how innovative approaches to health and well-being are being rolled out in Wales and elsewhere as a result of work by Bangor University’s Centre for Mindfulness Research and Practice. Dr Rowan Williams, Master of Magdalene College, Cambridge and former Archbishop of Canterbury, will visit Bangor University on Wednesday 11 December to deliver a public lecture entitled ‘R.S. Thomas, Christianity and Buddhism’.